Art by Catharina Engberg: Struggling with landscapes from imagination. Struggling with landscapes from imagination. Maybee I make it harder on myself when I paint landscapes from my imagination. I guess it would be a bit easier to look at a photo. What to paint in the middle ofthe scene when I can´t paint figures and I don´t want to get too detailed? This painting looks rather boring. I have tried to paint some negative areas in the foreground. But I think I should have a completely different view at the back of the trees, maybe houses or mountains or something. I´m begging of proplems, I know, when painting watercolour. I´m so happy for your visit! Very beautiful landscape painting with amazing colours and light !!! Thank you for you visit and kind comment! Lovely effects in this Catharina, painting from imagination adds surprises for sure but I know what you mean by what next? Thank you Lorraine! Imagination sure is difficult. It's beautifully painted. I would really struggle painting from my imagination! It is struggel. Thank you Neesie! 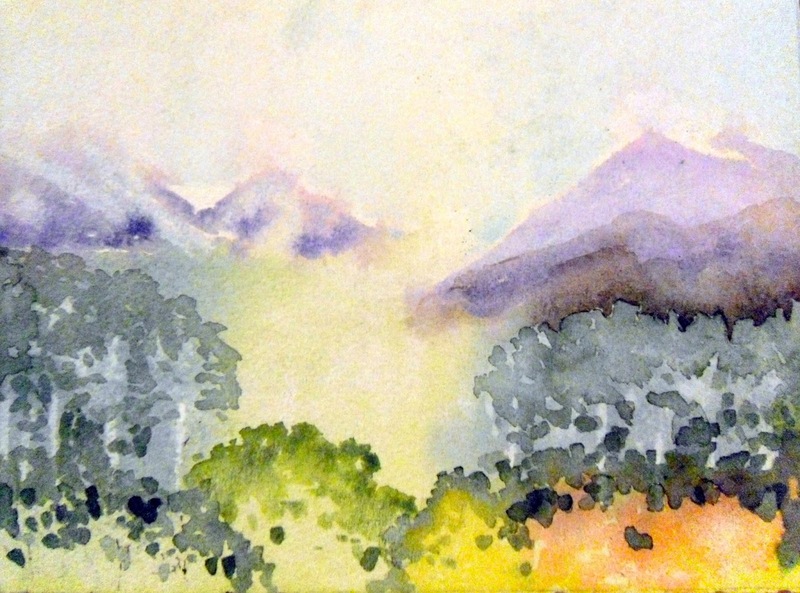 I LOVE this watercolor color landscape. I LOVE the colors and the composition and in my opinion despite of your idea that it's not perfect exactly this makes it perfect. Leave it as it is for the moment because I love it that you left some place for fantasy for the viewer. Och angångeende din fråga- njäe, tyvärr. Det blev tyvärr inget av det just då, det var visst fel tid för mig,men jag satt faktiskt och tittade efter kurser på nätet samtidigt som du kommenterade igårkväll, så watch this space! I struggle with landscapes myself, but this has such beautiful colors, I'm sure you will come up with something magical to finish it. I think I have to visit Tito for example and study more closely how he works with his landscapes. I know what I want in a landscape, but I can not get there myself. Get so irritated when painting! Thank you John for your visit! Hola Catharina: Muy bonito el paisaje y doble logro que es imaginativo. Ciertas veces actuamos como un profesor y creemos que esta mal, no es asi, el trabajo espontáneo y libre es auténtico y debemos apreciarlo ya que es nuestra obra. Un abrazo amiga!! What a wonderful imagination! Beautiful Catharina! I don't think I could paint a landscape even with a photo and you have done it from imagination. It looks great to me. Water colour is scary and I can't tell you how many I've messed up. To me your landscape is finished, the centre looks like bright reflections on a lake, I love it.